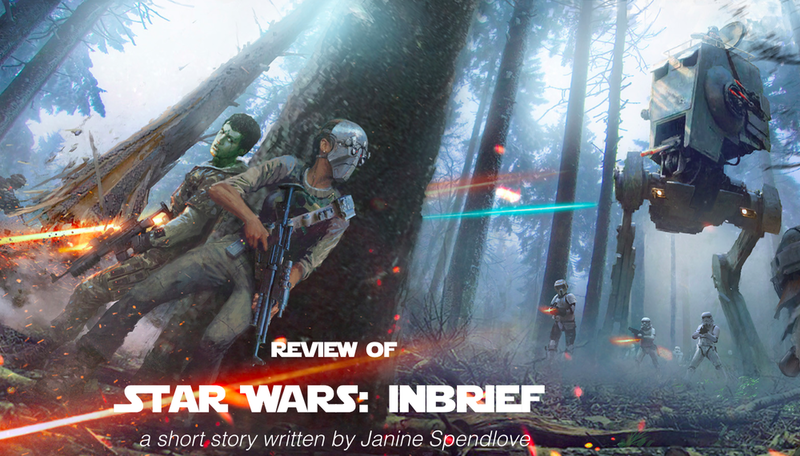 “Inbrief” was written by Janine K. Spendlove. Originally released in Star Wars Insider magazine issue 161, with art by Jose Cabrera. The short story can also be found in the Star Wars 2016 Del Rey Sampler digitally here, and the paperback release of Battlefront: Twilight Company. The first time I read this story it was after reading the novel Battlefront: Twilight Company. I remember enjoying the story, but not digging into the roots. During that time I was absorbing everything Star Wars released in gluttonous fashion. All those Journey to The Force Awakens stories, Rebels TV show, THE NEW MOVIE, and more! By bursting through the material it was like focusing on dirt blowing in the wind. I enjoyed it all… But missed out on cherishing the message. The purpose! The splendor of the story. When I came back to this story over six months later I had time to get inside the mind of the characters. What a delight it was! I enjoyed the emphasis on family. Family is not something black and white. What binds people together could be through their loyalty or even their ideology. Before joining Twilight Company Brand was a bounty hunter. Not by choice or anything positive. She is pushed into that. Once she was a "good" person, but she still has a heart, even if it was not always noticed. Likewise, what we have done, or how we have been treated does not define a person. It is how one moves forward through their actions. Brand cared about Twilight Company. They were her family. This story solidified her reasons. The structure of the story worked really well, for the length. Going from essentially one scene, with flashbacks layered in to emphasize key points in the story brought out the intensity of the final moment. The crossroad. The decision Brand had to face. The story was easy to follow and absorb. A lot of work is put in to paint a concise picture of that turning point in Brand’s life. Thank goodness that there is more of her story in Alexander Freed’s Battlefront: Twilight Company, because Brand is a wonderful character! What Spendlove did with the character was amazing. I highly recommend this story, and hope to read more Star Wars stories written by Janine K. Spendlove!